While the list of things scaring me was varied and long, when I arrived at my campsite I discovered one fear in particular standing head and shoulders above the rest. More than all else, hands down, the prospect of the sun setting terrified me. There was something so final about it. I was all alone. Cal had chosen a spot about five miles away and there was no way to communicate with him, no satellite phone or flare or even matches with which to build a signal fire. The trailhead where we’d left the truck was only a two-hour hike away, but without a flashlight I was unable to traverse the steeply forested, snow-slick, north side of the mountain I was on in the dark. If I panicked I had no weapon to wave wildly at the night, no back door, no safety-net. Once darkness fell I’d move beyond the reach of any help and for the next eight hours or so, whatever came into my circle I’d have to face. Which is exactly what I’d intended of course. Back home it seemed like such a good idea. Struggling to control the impulse for white-eyed, foaming flight I forced myself to sit down on my sleeping bag facing west. I called on the desperation that had driven me up there in the first place and made myself watch, eyes unaverted, as the sun dropped towards the peaks, observed as the light around me faded and thinned—and in the process discovered something surprising. You may not know this but it turns out night doesn’t fall. It rises. Shadows start at the bottom, puddling and pooling in the hollows and roots like water and then filling things up from there. Initially, I was suspicious as I watched the darkness climbing out of the valley towards me, enveloping each boulder, bush and bare spot in its path. But eventually some subconscious, nightmare expectation in my mind relaxed and I realized there wouldn’t be any eerie wailing or flapping of leathery wings, nothing with foul breath descending on me from above and behind. The big, bad dark was not coming to get me after all. On the contrary, as the night shadow rose higher the world grew hushed and peaceful, feeling—rather than a monster—more like some great mother coming to tuck her children into bed. I watched as she enfolded everything in a calming embrace and when the shadow finally reached my toes I sat stock-still, observing the light that bathed me fade as the sun sank behind the mountains. Suddenly, I felt excited and couldn’t wait to change into my long underwear, brush my teeth, and climb into my good-to-15 degrees-below-zero sleeping-bag. I zipped around and still had enough time, after climbing into my bag, to watch as the last rays of light disappeared from the higher ring of mountain peaks that surrounded me. Everything terrestrial was now encased in the beginning shadows of twilight but it would take a couple more hours for everything to move into full darkness. I lay there, looking up at the fading blue of the sky and realized that the shadow was still reaching skyward, enfolding even the air, molecule by molecule, and as I watched the darkness deepen in tiny degrees I began to tingle at the thought of seeing the stars. Back in the Sierra Nevadas during the long nights of my survival training course, while lying there looking up at the brilliant, twinkling worlds spread out above me, I’d slipped into a state of quiet, serene delight. Feeling like no matter what happened everything would still be all right, that I was safe and cradled in ways that defy explanation. As the memories of those nights came flooding back I grew excited–couldn’t wait to feel that sense of well being again–but since I knew it would be a while yet, in the meantime I turned to gaze at the deepening shadows on the ground around me. My enthusiasm swiftly unraveled as I watched the things of this world, the trees and mountain peaks, flitting birds, the carpet of dusty pine needles and stones, the three plastic water jugs and backpack I brought with me, disappearing into the gathering darkness. The horrified, creeping fear returned as I felt myself being cut off and isolated, stripped of everything familiar, and I began to wonder again if something would come out of that dark unknown to get me during the night–a cougar, a drunken hunter, a wave of bone-chilling cold, a demon. I frantically reminded myself of the stars that were coming as I turned my eyes back up to the deepening darkness of the sky. And it was in that moment, as I lay trembling and unexpectedly longing for the darkness of full night to arrive, that I had my revelation. In a flash I recognized a truth that seems so obvious now but that I’d somehow completely missed. Both the light and the darkness conceal and reveal. The light reveals the ordinary world around us. It gives us one another and makes everything seem smaller and more manageable, wrapping us in a bright and sunny cocoon because as mortals we’re tiny and fragile and need a sense of protection. But it conceals, too. It creates the illusion of a blue sky, a ceiling, a world that has limits and is safe and known and predictable. It isn’t until night arrives that this seductive illusion of containment dispels. The darkness comes swallowing everything in its shadow, tugging us away from the usual daylight edges we cling to with white-knuckled fingers until there, in our moment of greatest fear and isolation, it tenderly unveils the larger truth…that we’re cradled, floating in infinity. The insight was blinding. Even though it didn’t alter the basic realities of the situation–I was still all by myself out in the middle of nowhere exposed and trapped–it transformed the darkness from a terrifying, alien thing I had to outsmart and survive into a bringer of gifts and grace. I felt as though I’d reluctantly entered the enemy’s camp only to discover it wasn’t an enemy at all. It was an ancient, lovely world of starlit depths that had been longing for me, calling me home for years. A decade of depression slipped away as I fell into an exhausted sleep and, when I woke back up again a few hours later, a twinkling universe stretched out above me. The soft radiance bathed me as I lay there and quietly wept under the steady, pulsing of starlight. you know I absolutely LOve your description of night fall—rising! I never realised this before! I know! I’ve thought about that part ever since and realized that for those of us living at the very bottom of the landscape, like most of us are, then it really does look like night is falling. But it’s an optical illusion. It wasn’t until I watched it from a higher perch that I saw how the earth’s shadow is actually rising. Pretty amazing eh?! 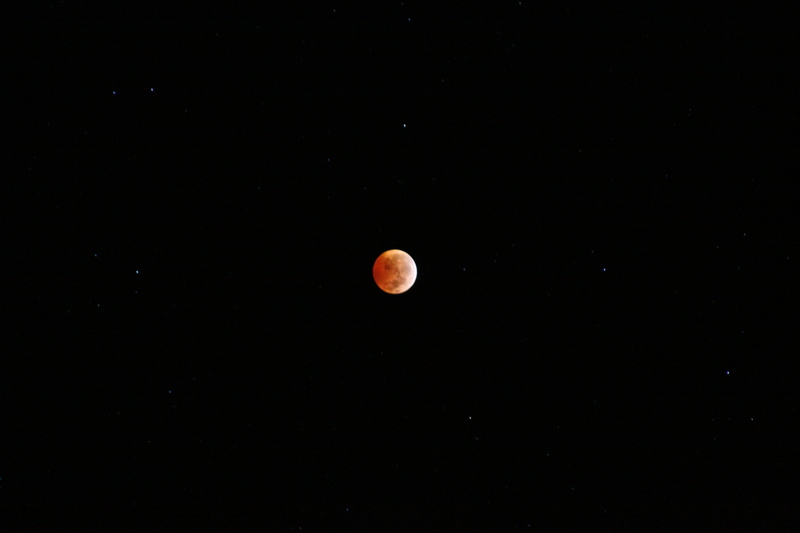 Oh…I forgot to mention how great the image of the lunar eclipse is at the top of this post. Absolutely PERFECT. Reading this brings back so many memories of sharing this with you. And yet, we were so apart. Those three days and nights without food, or as you said; not even a match or knife…above 9,000 feet in the mountains…who would have thought we would feel such connection and closness…so far apart and away. That was such a great “Quest”…I can’t wait to read your conclusion. And…I forgot about the darkness rising! Thanks for remembering what I had forgotten.